163 in stock Need More ? 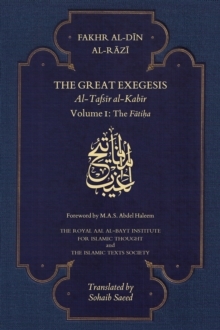 Fakhr al-Din Razi's "Tafsir", "The Great Exegesis', also known as "Mafatih al-Ghayb", is one of the great classics of Arabic and Islamic scholarship. Written in the twelfth century, this commentary on the Qur'an has remained until today an indispensable reference work. "The Great Exegesis" is a compendium not only of Qur'anic sciences and meanings, but also Arabic linguistics, comparative jurisprudence, Aristotelian and Islamic philosophy, dialectic theology and the spirituality of Sufism.---The present volume is the first ever translation into English from "The Great Exegesis" and focuses on the first chapter of the Qur'an, the "Fatiha". This scholarly yet accessible translation gives readers a thorough understanding of the most commonly recited chapter of the Qur'an; it also opens up for readers a window into the thought and practice of one of Islam's greatest theologians. This volume includes a foreword by Professor M.A.S. Abdel Haleem, King Fahd Professor of Islamic Studies, University of London.